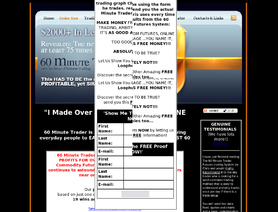 It works but.......DO NOT USE IT TO TRADE FOREX!!! I have used this system and as another poster commented IT'S NOT MEANT TO BE USED FOR FOREX AT ALL so I cant understand how people who can at least read haven't managed to work this one out. In the training material provided (which does need updating) there is no mention of FOREX however its main use is in trading the DOW (YM) AT THE OPEN - it can also be used with any market like the FTSE Russell DAX CAC40 or S&P NOT FOREX as the setup doesn't lend itself to the FOREX market - which never really closes but is traded almost continuously. It works pretty well with average 18 out of 20 winning trades. The stop is 18pts on the DOW, you can calculate what the equivalent stop needed for other markets. 60 minute Trader as one commenter previously said, is NOT intended to be used when trading FOREX and it's stupid that people cant work this out for themselves. I use the system, it's cheap, it works and Chris posts up (or used to) all the trades he takes using it. The stops used are quite wide and as another commenter said it does need updating but apart from that its a great trading system but only realistically on the open of the market, not really for any other time. I'm really interested in this system, however, when I write to Chris, I get no replies. I'm trying to find out if this system is still successful. I can't find any recent data indicating it still works. Anyone still having success with it using the mini dow (YM) market? Thank you very much. Scam, big time. Refuses to honor his money-back guarantee and won't even respond to emails. How can we get this guy put in jail? I won't call it a scam but the quality of material, videos etc is not good. You can not get clear message especially newbies.The education material is old (2005) never reviewed and updated. If you ask a question, won't get timely answer and practically no refund. Chris Kobewka or his system has nothing to do FOREX, why on earth is 60minutetrader being reviewed under FX Education? This is a scam I tried to get a refund for this poor quality rubbish and never got a decent reply. I tried to get a refund but never got any reply. I was browsing this site as I often do, to see what the latest news is on systems. I was absolutely amazed to see the 60mt trader up with one star. This system is the only one that I am currently using and have been doing for the past months. It works, is fully back testable and the results are truly amazing. It is ONLY designed to work on the YM, once per day and will only make you a small amount of points. BUT, it will do this regularly. There are various decisions that the trader can make, ie. exit on an indicator or a set amount of points. I trade a number of contracts based on both, so I average out the profits. Any reviewers that have stated any linkage to forex or scams are either lying, or are talking about some other system. For those that purchase the system, trade the open and no other optional trades. The open trade will make money and I would have no hesitation in endorsing this course to friends and family, it truly works and is simple! I've been using 60MT for a couple of months now. It's fairly clear cut, but at first, I kept playing with it going beyond the first trade of the day and ended up losing money. But, now that I have gotten myself to walk away after the first trade (hard to do), I've been making money. I think out of the last 11-14 days, I've had one loser. The one thing I don't like is the 17pt stop. I've experienced some of those and it takes the better part of a week to recover. I'm also watching the open very closerly and if MyTrack shows a continuing climb or decline in the DOW and the technicals support it, I'll go for a quick 6-10pts before the 60MT trade kicks in. The initial just needs to be moving along to take the trade knowing that it's a bit risky. Customer service isn't very responsive, although many of the questions most will have may be found on their website.